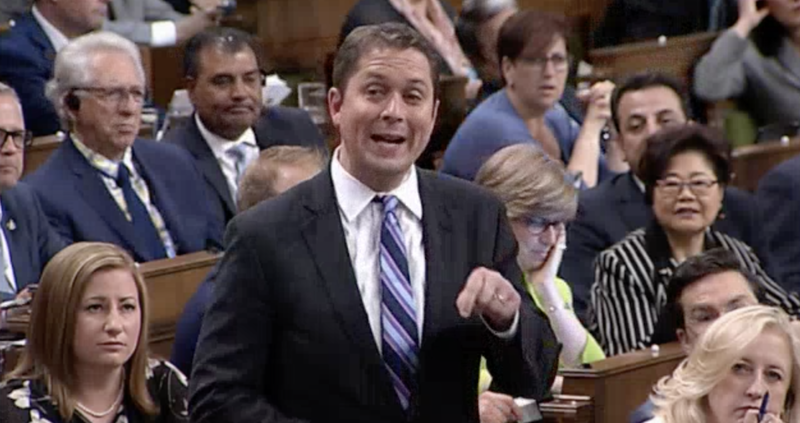 Conservative leader Andrew Scheer during Question Period on Tuesday. Hon. Andrew Scheer, CPC (Regina-Qu-Appelle): Mr. Speaker, this is an extremely sad day for Canadian taxpayers. The Prime Minister is forcing them to fix his failure on Canada’s energy sector. It did not have to be this way. Kinder Morgan was never asking for a handout. All it wanted was a clear path to get this project built, which is what the Prime Minister has failed to do. Now taxpayers are on the hook for the Liberals’ mess. Could the Prime Minister give a guarantee that these costs will exceed no more than $4.5 billion? Hon. Geoff Regan, Lib (Halifax West), Speaker: Order. Members know we have to be careful not to do indirectly what we cannot do directly, so I would avoid using a word that equates to a name at the same time. We cannot use the name of a member, so I would ask the Minister of Finance to try to avoid that. Hon. Bill Morneau: Mr. Speaker, I note the audacity of the member opposite in talking about not getting a pipeline to market, which is what he and his party were unable to do. We have stepped forward and said that we are going to take the decision to put a project in the national interest forward so that we can create the economic advantage we are seeking. The economic advantage for Canada is $15 billion of advantage to our economy, and 15,000 jobs. We are moving forward in the national interest, for Canadians. Hon. Andrew Scheer: Mr. Speaker, before the 2015 election, pipelines in this country were built without taxpayers’ money. They were applied for, they were approved, and they were completed without a cent of taxpayers’ dollars. The only thing that has changed between then and now is that we have a Liberal government. Why is it that every time elements of our energy sector get nationalized is when there is a Trudeau in the Prime Minister’s Office? Hon. Geoff Regan: You are not making it easy for me. The same point applies. Members should avoid referring to someone who is currently a member by name. I can certainly interpret it that way. The hon. Minister of Finance. Hon. Bill Morneau: Mr. Speaker, let us evaluate what the member opposite just said. In the decade before 2015, not one pipeline to tidewater was built. We know this is a fact. We know the project is going to ensure that we create an advantage for Canadians, an economic advantage that goes along with our overall plan to ensure that the environment and the economy go hand in hand. This is in our national interest. It is creating jobs in Alberta, British Columbia, and across our country. Hon. Andrew Scheer: Mr. Speaker, let us talk about where the advantage on this deal is going. The Prime Minister is now cutting a cheque of taxpayers’ money, $4.5 billion, which is going to shareholders in a Texas-based company. This is in addition to the hundreds of billions of dollars that have already left Canada’s energy sector. The Prime Minister claims he wants to attract investment into Canada. How much of the $4.5 billion that is being sent to Kinder Morgan will be spent and invested in Canada? Hon. Bill Morneau: Mr. Speaker, with no business experience, I understand the member opposite might not understand what we are talking about. We are talking about a $4.5-billion investment in the assets of Kinder Morgan, creating long-term value for our country. We know that is the right thing to do for our country. Hon. Geoff Regan: Order. The hon. member for Calgary Signal Hill will please come to order. Members will note that it is possible, without breaking the strict rules, to say things that cause disorder. I would ask members to be cautious in what they say, in order to try to avoid creating disorder. The hon. Minister of Finance has the floor. Hon. Bill Morneau: Mr. Speaker, we are making an investment in Canada’s future. We know that investing a fair amount of money into the assets of the Trans Mountain pipeline and the expansion will create economic advantage for our country. We are creating 9,000 jobs in British Columbia and jobs across the country that are going to make a real difference for Canadian families. At the same time, we are adding up to $15 billion to our economy annually. We know this is important for our country. Has anyone clarified whether we are buying out this poor Texas Oil Co with $4.5B Canadian or $4.5B American. ?